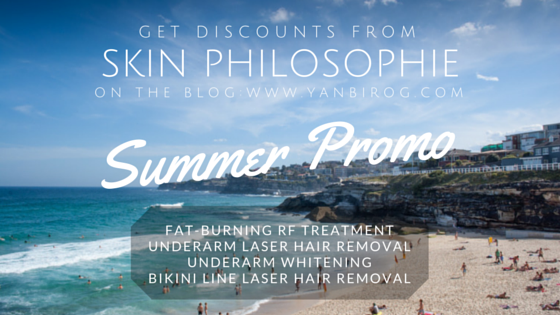 Get a Summer Ready Body with Skin Philosophie's Summer Sale Promo! Guess what! Skin Philosophie Medical Aesthetic and Lifestyle Center, your one-stop center for immaculate correction, holistic wellness, and lifestyle solutions is launching new promos for us this summer! Take a look at and see what services you could get for less, and get ready to achieve that summer body you've been waiting for! Amazing deals right? And if you don't know yet, Skin Philophie prides in being a leader in the field as they utilize advanced technology, equipment, and skin care products to ensure customer satisfaction. The center is headed by UK-trained doctor Dr. Kyla Talens, who considers safety and efficacy paramount to delivering their services. They offer customized patient-centered skin care programs, and always takes into account the client's resources and preferences before prescribing anything. You're in the best hands! If you want to avail of any of the summer promo services above, go on and contact them for a reservation, but since we're feeling extra generous we're extending an additional 5% discount to readers of this blog! Yup! i want to help you get that bikini ready body you've been dreaming of at a lesser cost!